Description: Every great promotional plan needs a strong foundation based on observation, data, and vision. This session will introduce you to various strategies designed to guide you into developing and maintaining your own professional and strategic plan. Description: What exactly does living in the digital age mean? How does it work? In what ways can you navigate it? This session will walk you through the process on how to curate content, engage others in conversations, and use it as a way to educate others about your work and studio practice. Description: What do you do when an exhibition or event has ended? Do you find yourself archiving collateral to reflect on or do you move on to the next thing? This session will introduce you to strategies that will benefit the next exhibition or event by determining a better path for success. Description: There’s a growing need to expose, educate, and engage artists into making their passion and talent sustainable. The reality is that self-employed artists and creative entrepreneurs need to be equipped with the necessary skills to move their careers forward, evaluate progress, establish objectives, and to determine the best possible route to achieve career goals. This session will introduce you to six key points to effective self-promotion. June 13, 2018 | Professional Practices for Artists: Business of Art at the Sevenwinds Casino in Lac Courte Oreilles for the Northern Woodland Indian Art Group. 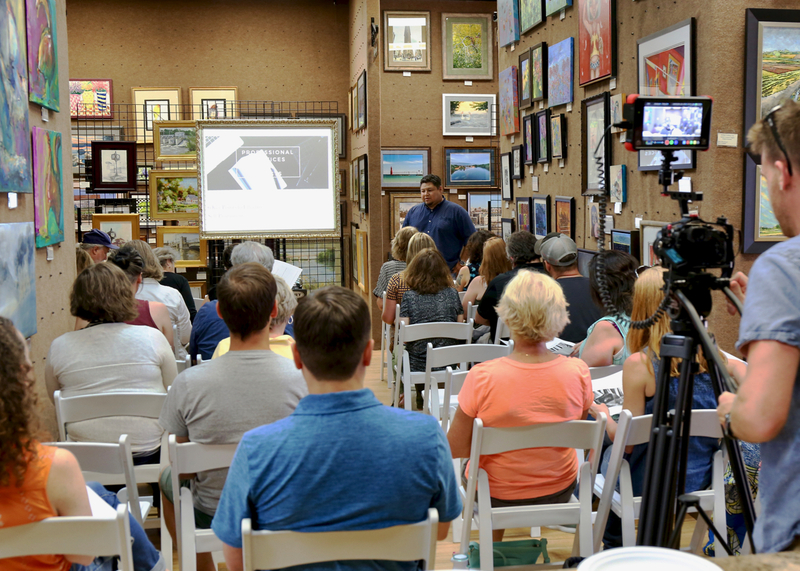 September 29, 2018 | Professional Practices for Artists: Business of Art with the Sheboygan Visual Artists. Frank has presented throughout Wisconsin to universities, college, artist groups, and arts organizations on the topic of the business side of art. Please fill out to the form below to inquire about his services.